Ride with your motorcycle partner for a traveling. If you’re comfortable riding at night and both you and your biker match have a sense of adventure, one activity that you can try is to follow the stars. Years before the invention of the motorcycle, explorers and navigators spent their time looking to the various stars in the sky to help them navigate and understand the world around them. Most everyone knows the standard guiding stars of Polaris, the Southern Cross, and the Big Dipper, and nearly everyone can pick out the belt of Orion. Did you realize that these same stars can be used to guide you through the night on a riding adventure? Polaris or the North Star as it sometimes called marks the point in the sky that corresponds to the northern pole. The Belt of Orion straddles the equator, and there are literally thousands of stars visible in the night sky that can act as beacons for your exploration. Plus, motorcycle riding by the stars is essentially a two person activity; after all, someone needs to keep their eyes on the road, right? Start by getting away from the city lights, keeping to the drivable roads. Not only will it be easier to see the stars, but you probably won’t have as many people on the road to interfere with your trek. Find a place to have a bite to eat, and look at a road map; that will help you determine where you can actually go, according to the roads. Once you’re finished with your meal, walk outside and pick a star together, one that is bright enough to be seen from many different areas. Then it’s just a matter of one person keeping their eyes on the road, while the other person keeps their eyes on the stars. 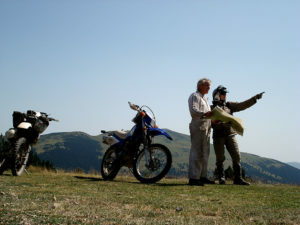 Communication is one of the key ideas here, since both single bikers need to communicate effectively with the other person to make sure they follow both the stars and the road that can provide the trail. While using hand signals or touching is viable choices for communication, it can also be a good idea to use in-helmet communication devices, or motorcycle intercom devices. These small and relatively inexpensive devices can be purchased online, or in most motorcycle shops. Also don’t be afraid to stop every once in a while, check your map and get your bearings. While getting lost can be fun, it’s always a good idea to have the ability to get you found. Remember, riding a motorcycle is about independence and self-reliance. This entry was posted in Meet Bikers, Ride out, Uncategorized and tagged biker match, motorcycle adventure, single bikers on by .